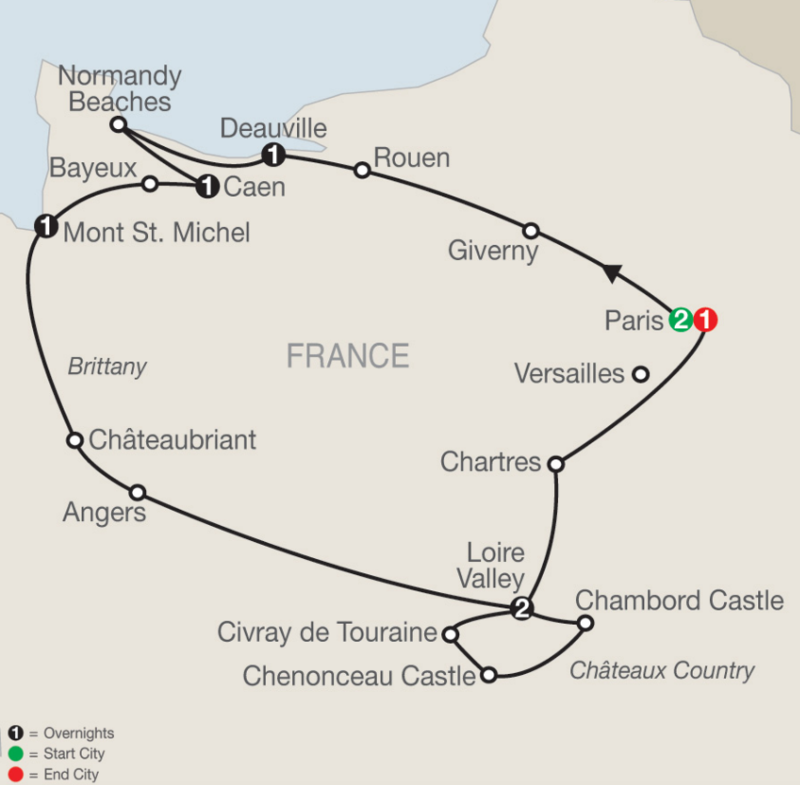 Visit Juno Beach on this Normandy, Brittany & Châteaux Tour by Globus | Travel Expressions Ltd.
See the highlights of Paris plus Brittany, the Loire Valley, and the World War II landing beaches in Normandy in a short amount of time – this year during the 75th anniversary of the DDay Landings! Beautiful scenery combined with famous landmarks, charming châteaux, and fascinating history sum up this tour—with overnights in Paris, elegant Deauville, Caen, Mont St. Michel, and the Loire Valley. World War II history comes to life as you focus on some of the locations involved in D-Day, June 6, 1944. You’ll visit the American Cemetery at Omaha Beach and Juno Beach Center and Park. Go even further back in history when you visit the famous 8th-century Abbey of Mont St. Michel perched on a rocky isle; the 13th-century gothic cathedral in Chartres; and the jewel of the French Renaissance, Château Chambord in the Loire Valley, and a huge castle with towers on all corners. Also visit the 16th-century château of Catherine de Medici, Chenonceau, and a fairy-tale castle with a moat, drawbridge, and towers. Welcome to Paris! At 5:30 pm, meet your Tour Director and traveling companions, and leave the hotel for a welcome dinner at a local restaurant and an orientation drive for a first impression of this magnificent city. In the morning, an optional excursion to the impressive Palace and Gardens of Versailles, built by the “Sun King,” Louis XIV, is available. Sightseeing with a Local Guide features the Opéra, Madeleine, Champs-Elysées, and Arc de Triomphe. Visit magnificent NOTRE DAME CATHEDRAL with its Rose Windows. Later, dinner and a lively cabaret show at one of Paris’ nightclubs might just be the ticket! In Giverny, a highlight visit has been included to CLAUDE MONET’S HOUSE AND GARDENS. The master of Impressionism created the flower- and water gardens himself, an inspiration for his famous water lily series. Continue to Rouen and admire the façade of the cathedral, which was one of Monet’s favorite subjects for his Series Paintings, where he captured how a subject was visually influenced by the ever-changing light. Twenty paintings of the cathedral existed, and many are today in Paris’ Orsay Museum. Time to stroll along the lovely cobblestoned Rue du Gros-Horloge leading to the square where Joan of Arc was burned in 1431. Arrive in Deauville. This seaside resort is famous for its international film festival, and became home to the French high society. Don’t forget to walk the Promenade des Planches, boards in tropical wood, built in 1923 so that the elegant ladies could walk on the beach without spoiling their dresses. Focus on the scene of the Allied Forces’ landing on D-Day, June 6, 1944. Take pictures of the Pegasus Bridge, visit JUNO BEACH CENTER and PARK, then stop at Gold Beach for a view of the Mulberry Harbor remains at Arromanches. Next is POINTE DU HOC. 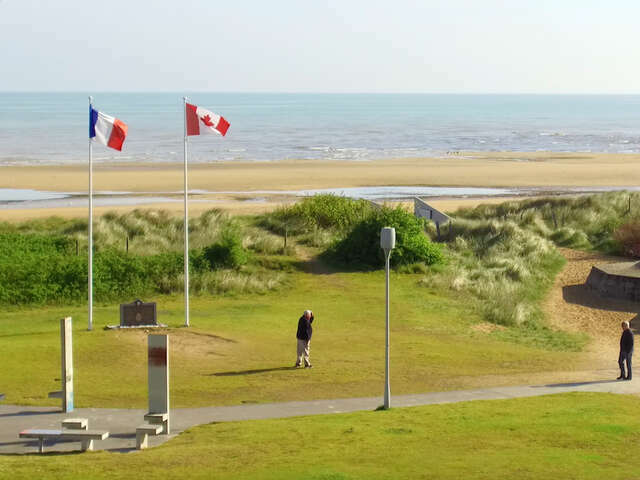 At OMAHA BEACH, see the Monument to the Braves, and visit the AMERICAN CEMETERY and memorial. Continue to Caen for your overnight stay. Day 5 CAEN–BAYEUX–MONT ST. MICHEL. Drive straight across Brittany via Châteaubriant to Angers, and take pictures of the impressive 13th-century castle. Then, continue your journey to the Loire Valley. Tonight, why not sample French cuisine at one of the area’s excellent restaurants? Day 7 LOIRE VALLEY. EXCURSION TO CHÂTEAUX COUNTRY. A wonderful day: visit two of the most important castles in the area. Start with the jewel of the French Renaissance, CHÂTEAU CHAMBORD. The castle is the largest château in the Loire Valley, originally built to serve as a hunting lodge for Francis I. Next is the 16th-century château of Catherine de Medici, lovely CHENONCEAU. End this fascinating day with a WINE TASTING at the Père Auguste wine cellar in Civray de Touraine to learn about the local wines before returning to your hotel. On your way to Paris, stop in Chartres and visit its superb 13th-century gothic CATHEDRAL—a jewel of medieval architecture. Tonight, you may wish to join an optional excursion to the artists’ hill of Montmartre, followed by a relaxing cruise on the beautiful Seine River as a proper au revoir, Paris!